About 32 percent of Seattleites are ethnic minorities, up from 26 percent in 1990. 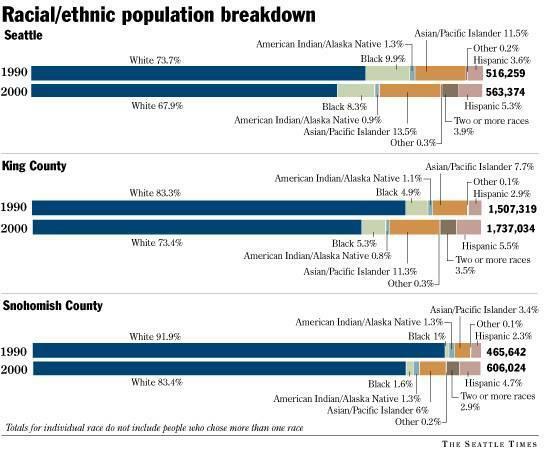 In King County, 27 percent are minorities, up from 17 percent. In Seattle, Hispanics are spread out and concentrated only in South Park, making up one-third of that community. Parts of Bellevue, Redmond, Kent, Bothell, Auburn, SeaTac and the Lake Youngs area in Maple Valley saw the largest growth in Asians and Pacific Islanders. Blacks are concentrated in the Central Area, Rainier Valley and South Seattle. Asians and Pacific Islanders, at 13 percent, make up Seattle's largest minority. In the International District and parts of Rainier Valley and Beacon Hill, they are at least half the population. Two decades of large-scale immigration has significantly changed the makeup of the area's Asian-American population. Chinese are the dominant Asian ethnic group, overtaking Filipinos, who had the greatest numbers in 1990. The fastest growing groups were Asian Indians and Vietnamese, many of whom are recent immigrants. Only one in 10 Asians was Japanese in 2000, compared to one in six in 1990. * "Other Asian" includes those who marked either that category or more than one Asian category. * Population totals do not include those who identified themselves as Asian and at least one other race. Source: U.S. Census Bureau. Analysis by Tom Boyer, Justin Mayo and Stuart Eskenazi - The Seattle Times staff.